Foreigners have become the main driver pushing up Malta's population figures, according to a new report which estimates some 27,000 more people will be living on the island in the next 18 years. The population increase marks six per cent of the island's population and is almost double the number of people currently living on Gozo. According to the projections, published as part of a detailed report by the National Statistics Office, the increase in Malta’s population won’t stop there: it will have increased by nearly 40,000 by 2055. The report, entitled Trends in Malta, is a collection of different statistics painting a picture of life on the island today and tomorrow. It points the finger at migration as the main factor behind population growth, saying the number of foreigners settling in Malta last year was almost triple the number of births. “It is more likely that the next inhabitant added to the population is an immigrant than a new-born,” the report reads, adding that nearly 13,000 migrants settled on Malta in 2015. It says that the island has been steadily attracting more foreigners with the number of non-Maltese living here more than doubling over the last decade. The population projection is based on a formula drafted by the EU’s statistical arm. A closer look at the population projections shows that the largest increase is expected to come among those aged 75 and older. The current number of elderly people, some 32,000, is set to more than increase to 65,000 by 2035. It will increase to some 72,000 by 2055, the NSO projects. The report says that “old-age dependants” currently make up around 18 per cent of the total population but would make up around 50 per cent by 2055. This, of course, is not a new trend. A look back at statistics for previous years, laid out in the same report, shows that pensioners had stood at 11 per cent of the population in 1995. A few pages down, the report returns to the impact foreigners were having on society, this time at school. Although the report does not give the total number of foreign students attending school on the island, it does break down figures for different districts. According to the report some 37 per cent of the foreign students attending school in Malta did so in the north of the island, with a further 30 per cent doing so in the area known as the northern harbour district – which encompasses Msida, Ħamrun, Floriana and the surrounding environs. Just five per cent attended school on the other end of the Grand Harbour, the southern harbour district. According to the report, a third of foreign students came from the UK, with a further 18 per cent, coming from Bulgaria. Some 17 per cent were Italian, with 15 per cent coming from Syria. 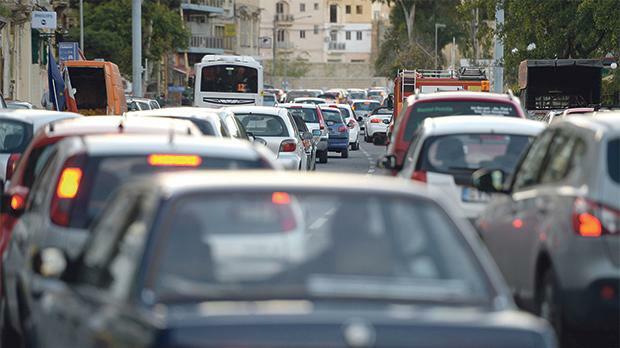 The report paints a worrying picture of the number of cars on the road. It says there were almost as many registered vehicles in 2015 as there were people aged over 18. The net stock of licensed vehicles continued to increase in 2016, reaching 358,947, an increase of 3.5 per cent over the previous year. In its traffic section, the report makes a brief but important reference to the number of motorcycle deaths. There were nine fatalities in 2016, the highest since 2005. This accounted for almost 41 per cent of the total traffic fatalities (22) last year. ■ Circulatory disease (39 per cent) and tumours (27 per cent) were the primary cause of death in 2015. ■ Church schools have the largest average class sizes. ■ The net stock of licensed vehicles on the road increased by an average of 33 vehicles per day in 2016, up from 20 vehicles per day in 2011. ■ More than three-quarters of people used the internet at least once in their life, and 97 per of those that did, did so every day. ■ Households consume almost a third of all the electricity generated on the island. ■ Building permits increased by 34 per cent from 2014 to 2015. ■ In 2015, male workers typically earned €1,300 annually more than their female co-workers.